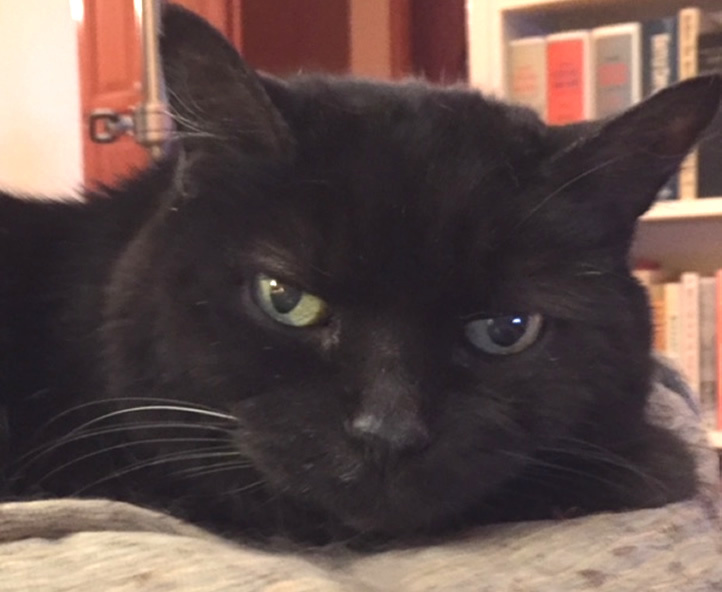 On May 24 my husband, Jim, and I held our dear kitty Bagheera in our arms as the veterinarian injected a drug into his vein, and he drew his last breath. I know we are not alone in having to make hard decisions that determine how the last days of a beloved animal companion will pass. But when you are actually in that position, indecision, uncertainty, fear, and grief may all surface making clear thinking impossible. Bagheera was 18 years old. He had a mass on his bladder, diagnosed only a week or so before it led to his failing. That was among the many health issues he faced all his life. The numerous bottles of pills that sat on our kitchen counter over the years testified to that. And, in spite of the fact that I was the daily dispenser of pills, occasional liquid medications and shots – all of which he hated – he still treated me like a buddy. He came into our lives when he was about nine months old from a PAWS rescue site. He was skinny, had a thin coat, and a nervous demeanor. But it didn’t take long until his little belly grew round and his black fur grew thick and shiny. Bagheeera loved to be petted and brushed, which of course we indulged. But he indulged me, as well, as he folded himself into a meatloaf and lay on my belly purring while I lay in bed at night. In the winter he slept on the back of the chair where I sat in front of the wood stove, his tail draped over my shoulder. I know many of you will know exactly what I mean when I say we had a very close relationship, and I loved this cat just as much as if he were human. I was not alone, as people who knew him loved his sweetness too. When it became clear that Bagheera was not going to survive the tumor, I grieved. Mornings I didn’t want to get out of bed. My first thought was that I couldn’t deal with watching him die, with losing him. Jim and I struggled to figure out what the best choice was for him – to let him pass peacefully at home or to intervene and have him put to sleep – a euphemism that hardly speaks to what it really is. To pass peacefully at home was a wonderful thought, but what about pain?, What if his death was the furthest thing from peaceful? What path was the kindest? What was most respectful of his life? The conversation in my head flipped anxiously from my suffering and loss to Bagheera’s. I felt immobilized. And, then I prayed. I asked for help, for guidance, for strength, to just be relieved of my self-centered concerns and to be able to be a source of comfort to this kitty who needed comfort now. What I received was “faith.” I don’t mean faith, like religious faith, I mean what the Yoga Sutra calls sraddha. Sraddha is translated as conviction, courage, confidence. It has been described as “a deep, positive, unshakeable conviction that reveals and nourishes strength.” And, the teaching is that sraddha is present within each one of us. We just have to tap into it. For me, sraddha was the certainty that I would be able to care lovingly for Bagheera as he needed, and that Jim and I would know the kindest choice for Bagheera’s end of life. This sraddha allowed me to hear the feedback of others. A friend who was a nurse told me that now we were dealing with “kitty hospice,” helping me to see this time was really about Bagheera and making him as comfortable as possible. The veterinarian who had been caring for Bagheera said there was nothing more that could be done, and with the mass he had, he would most likely suffer greatly. Faith is sometimes knowing what the next right thing is to do and having the courage to do it. But it doesn’t mean there is no loss or sadness. Some days the heaviness of the air and quietness of our house can feel great. But I ask myself, how do I want to remember Bagheera and our life together? Do I want it to be the images of his last days when he could no longer even walk, or eat, or drink? Those images grow less vivid as I work instead to see him as he was when he was well. When I do, I can almost smell the sweet smell of his fur, feel its softness, hear his loud “meow” as he carried his stuffed bear, and the exquisite joy of looking into his big green eyes. When my mind goes there, so goes my heart. He was ever faithful. Ever a blessing in my life. You captured so well all those many aspects of grieving and confusion that occur during the process of deciding upon euthanasia, while loving our companion animal. When reading your beautifully written essay, I reflected on Sraddha and truly appreciated the idea of “faith” in a wholly new way. Also, what popped into my mind was that could be a wonderful name for the next kitty that comes into your lives. Or not. I am sorry for the loss of your beautiful Bagheera and the companionship you shared. You write so beautifully , and your thoughts on what faith means to you are a good lesson on how we can try to do our best to understand the needs of those we care for. What a sweet, loving soul Bagheera was. Thanks for writing this, letting us all into your heart and yet again reassuring us, Elizabeth. I know Bagherra was soooo special to you. But what I bet you don’t know is how special you were to him. You saved his life and loved him like the regal prince that he was. Thank you for sharing your eloquent essay on faith..and the reminder that we all have it.. we just have to let go, and then it comes..